Exterior Features RARE - HIDDEN WESTCOAST GEM offering serenity & tranquility nestled in a PRIVATE CREEKSIDE setting. 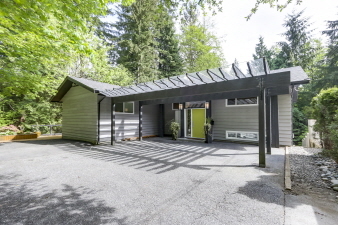 This 2 lvl, 5 bdrm contemporary home is tucked away at the end of the road and has been completely transformed by SYNTHESIS DESIGN & offers a very functional & beautiful family home. The Main Flr offers a bright open flr plan with a custom kitchen complete with SUB ZERO & BOSCH s/s appls., an eating bar, a great room format with sliders to the large entertainment sized decks overlooking the S Fcing Bkyard & gorgeous creek plus a priv master suite. Dwn offers a 2 bdrm & den in-law suite. This Canyon Heights home located in the Montroyal/Handsworth school catchments has easy access to shopping, transit & recr. A PRIVATE OASIS - perfect for those who love nature & seek privacy! Additional Features and Amenities Lovely and private creekside setting!